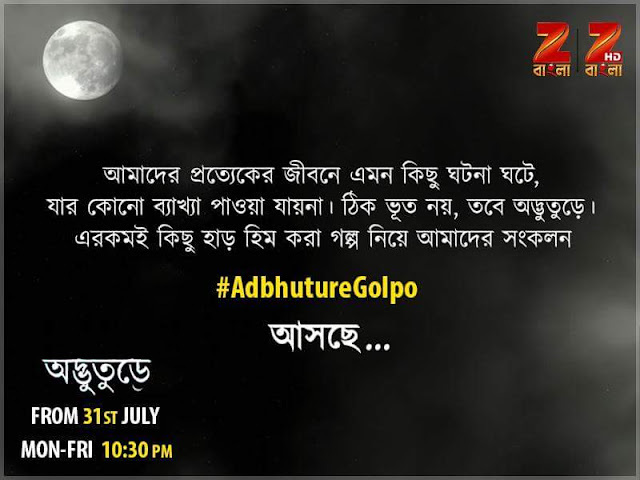 'Adbhuture' is an upcoming tv serial on Zee Bangla.The show is produced by Magic Moments Motion Pictures (P) Ltd, it will air from July 31 every Monday to Friday at 10:30 pm. Zee Bangla is a Bengali language general entertainment channel that began broadcasting in 1999. Its original programming has included television serials, reality shows and other game shows which depict different aspects of Bengali life. The writer also informed that the series will not just have stories revolving around scary ghosts but there will also be friendly, fun loving and kind hearted ghosts. There will be many new faces. Casting someone as a ghost who is playing some other characters in some other shows will not be convincing.